There are still a few folks left on the planet who think photography is so easy, nothing more than pushing that shutter button. Of course the ease of smart phone use contributes to the myth. But here’s a little anecdote; consider it like making sausage, as perhaps you don’t always want to know the gory details. In this case my assignment was to take high quality aerials of classic landmarks in El Dorado County, where I live. So I dug out my big 50 megapixel camera and off I went to Placerville Airport to hop into a Cessna 180 for an evening ride, taking advantage of the less-contrasty light. I’ve had some quality-control mishaps taking photographs through aircraft Plexiglass, so we opted to take the door off the airplane on the side where I was sitting. Fortunately, I’m not particularly afraid of heights and I figured I would be carefully belted in. However, the door-off choice made for a few interesting scenarios. First, the pilot said, no loose items; if anything falls out that door opening, it could potentially go into the tail and down the aircraft. That meant I had to do lens selection before getting on the plane, since I’m a fumble-fingered sort and I could picture a lens rolling out the big opening. Lens caps were stowed, pockets zipped. Most disconcerting, as I belted myself in, is that the seat belt was like those found on commercial airliners; just lift the clip to disengage. There were shoulder harnesses, but they were hooked to the lap belt. That meant if I bumped it the wrong way or snagged a camera strap or something on the clip,there was nothing to stop me from falling out except those shoulder harnesses, and it’s a very long and fatal step thousands of feet to the ground. Needless to say, I checked that seat belt every few seconds. 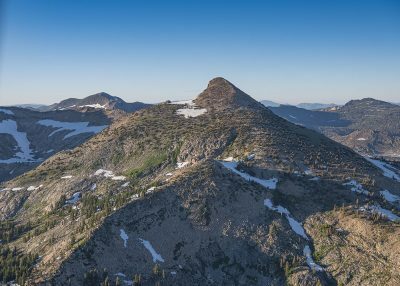 Anyway, here’s an up-close photo of Pyramid Peak, 9,984 feet, the highest peak in El Dorado County. It’s the craggy crown jewel of the Crystal Range of the central Sierras.